Does fintech dream of electric leaps? Brightness and brilliance within. 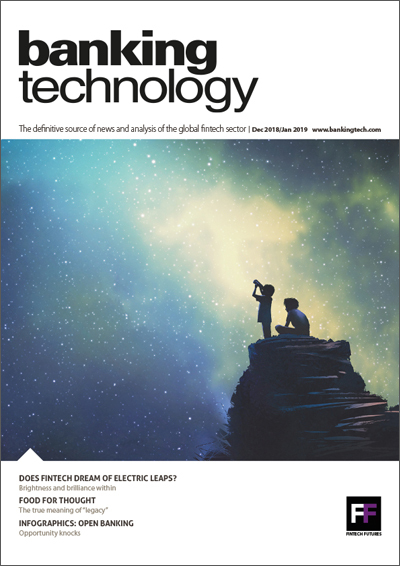 The latest edition of our flagship magazine – Banking Technology – is out now, packed with news, analysis and insights, case studies, research and expert commentary. Welcome to the magazine’s last edition of 2018 and the first one of 2019! On behalf of our team, I’d like to wish our readers and supporters a wonderful year ahead, bringing new discoveries, interesting projects, rewarding ventures and joyful events. A quick look back at the outgoing year’s major happenings reveals plenty of highs and lows. UK’s TSB Bank and its Spanish parent Sabadell will remember 2018 for a long time as the year its core banking tech migration plan went horribly wrong. Meanwhile in the US, core banking software vendor Temenos will celebrate 2018 as the year it broke into the domestic market with two challenger bank deals – Varo Money and Grasshopper Bank. Also in the US, the Securities and Exchange Commission (SEC) will mark its year as clamping down on initial coin offerings (ICOs). The likes of Airfox, Paragon and Centra Tech experienced SEC’s deserved wrath. The Centra case involved celebrities Floyd Mayweather Jr. and music producer Khaled Khaled, known as DJ Khaled, paid by the firm to promote it. Both were hit with hefty fines and a ban to promote any securities for a number of years. Talking about court cases, a UK start-up banking software tech firm, Thought Machine, settled its dispute with consultancy firm Capco over the IP of its flagship offering, Vault. It also received an investment from Lloyds Banking Group and signed a deal with Atom Bank. Meanwhile, another core banking tech firm, Netherlands-based Ohpen, hasn’t had much luck in the UK this year, losing a tech deal with Invesco and making 19 staff redundant. Ohpen said it was hoping to “revolutionise” the UK’s asset management market, but despite its best efforts and some “little nudges” by the UK’s Financial Conduct Authority (FCA), nothing has really changed. As a result, the fintech stopped part of its services in the UK. But there is a bigger revolution on its way – open banking. With the PSD2 and open banking regulation coming into effect at the start of 2018, the world of European banking will never be the same. It will take time and effort, but as Finovate’s Greg Palmer states on the pages of this magazine, “open banking is the future”. I doubt anyone would argue with that. There are so many more stories, so do keep an eye on our website for all the news and exclusive stories – the good, the bad and the ugly – from the financial services tech world. Progress, opportunities, challenges, lessons learnt and more. Sizing up the real threat. How mobile turned the bank into a trusted partner and friend. A future where everyone can win. Food for thought: what is legacy? Mindset, architecture, data and Dave. Finding success in a convenience-driven market. Lucky recipients of funds in the tech world. Five considerations for a successful rebrand. News – the good, the bad and the ugly. Appointments – the movers and the shakers. Industry events – mark your calendars! Out of office – a slice of satire. Just a couple of clicks and a complimentary copy is all yours! FinTech is inevitable as we can all see and witness. I think its safe to say we can estimate a large number of AI, Machine Learning and Blockchain related projects to succeed. Its exciting! We're looking for inspiring people in fintech! Be a part of the celebrations! A sublime eternal tune to the rhythms of fintech. Join us on 27 November for a live webinar with OneSpan! Celebrating the spirit of inclusion, diversity, and creativity. Learn how future-facing banks are using data analytics to create profitable offerings. Our new and improved digital platform brings you all the latest news, gossip, commentary, analysis, thought leadership and more.